The Alzheimer's Foundation has developed the Multitherapeutic Model for the treatment of people who suffer the disease. It is based on the active participation, human interaction, and multidisciplinary attention given to the patient that guarantees the quality of life improves. 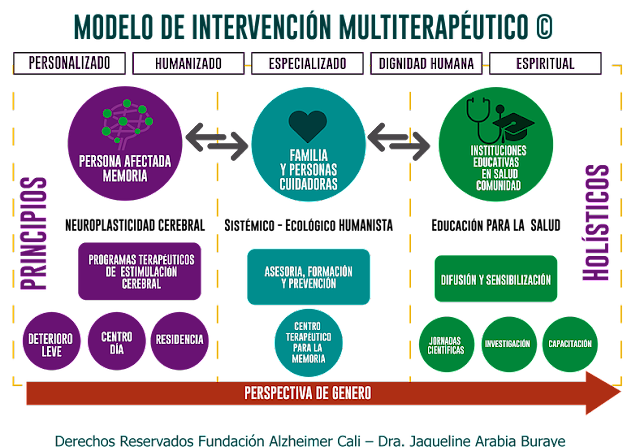 The model has a holistic, specialized, and human approach, focused on raising the human dignity and spirit. It is directed to the patients affected by the disease, their families and/or caretakers, and health and educational institutions as well as the community. Reactivation of conserved cognitive faculties. Connection with their surroundings, thus increasing their autonomy. Playful and social therapy to maintain motivation, interaction with equals, sense of belonging and participating attitude. Expressing their feelings, strengthening values: solidarity and cooperation. Emotional containment and overcoming negative feelings like disability, isolation, solitude and abandonment. Resilience from experiences that dignify them, in spite of their neurological deterioration. Construction of inner family and social support relations. Redefinition of the life project of the main caretaker. Integral formation in the handling of people with dementia.